So it's that time of year again! 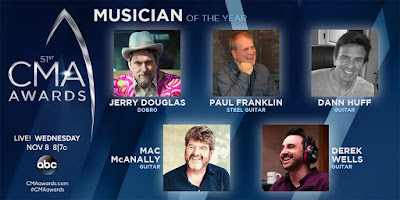 The 2017 Country Music Association Awards are fast approaching and, as usual, Tara from www.thedailycountry.com and I have teamed up to post our thoughts on potential winners. Read on for all the details and let us know your thoughts! Enjoy the show on Wednesday 8th November and come back here straight after the show for a round-up of performances and winners. Who will win – Got to be Garth...his substantial tour has been incredibly popular and, whilst he is in-between albums, his popularity doesn’t seem to be in danger of fading any time soon. Who should win – Eric please! Equally, it’d be great to see Keith pull this off but I’m not convinced that’s likely this year. Who should win - It is truly time to give this to Eric Church. Unmatched by his contemporaries with regards to his live show. Who will & should win – Interesting to see Blue Ain’t Your Color yet again making an appearance here. 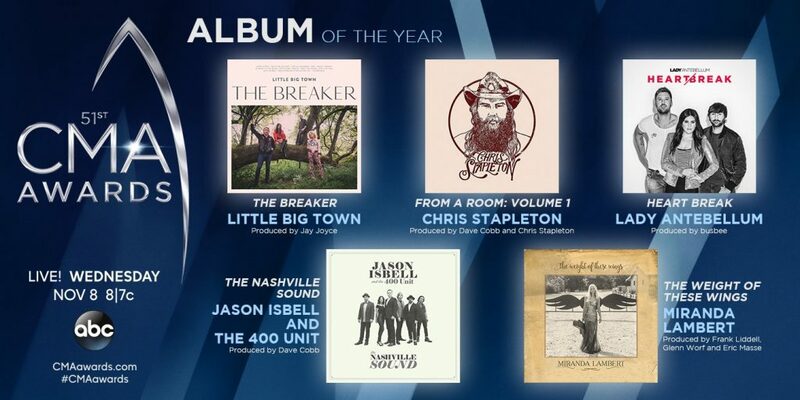 There’s the outside chance for an unexpected winner here but Better Man has been huge for Little Big Town and they deserve to take home the award here. Who will win – I’m not saying it deserves to win here, but Hunt’s record shattering monster of a tune will probably be rewarded. Hell, it might not be the best lyrically, but that pop-country melody stayed in my head for days. Go ahead and judge. 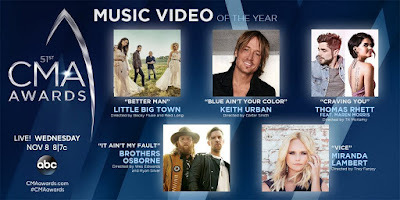 Who will win – It feels like this comes down to Little Big Town, Chris or Miranda. Both Chris and Miranda won this award with their last albums and, ultimately, I feel like this is Miranda’s to lose. The Weight Of These Wings was an incredibly well received album and seemed to connect well with a lot of listeners. Who should win – Surely it’s time to see Little Big Town take an Album Of The Year award?! There are some really great moments in the album and the quartet delivered a well-crafted, compelling album. Who Will Win - Isbell. Just as they rewarded Stapleton, the CMA will jump on the cool train and bestow the award on Isbell, who has said to Men’s Journal that he doesn’t consider himself a country singer. Who Should Win – Personally, I didn’t love any of these albums, but if I had to choose, I would pick Miranda’s. Who will win – The combination of a great song and the fact it’s written by Taylor Swift means Better Man probably wins this. 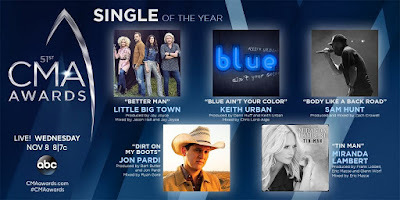 Who should win – Don’t get me wrong, both Better Man and Little Big Town are great but this deserves to go to Tin Man. It’s an incredible emotive song that really pulls at the heartstrings and, whilst I’m not particular a fan of Miranda’s, she undoubtedly did an excellent job with this track. Who will & should win - See Single of the Year responses since it’s the same songs. 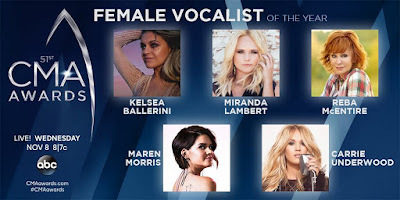 Who will & should win – Whilst Miranda and Carrie are arguably the two strongest contenders for this award I’m actually thinking this goes to Maren. Miranda and Carrie have both had quite quiet years relatively and this has certainly been a good year for Maren. 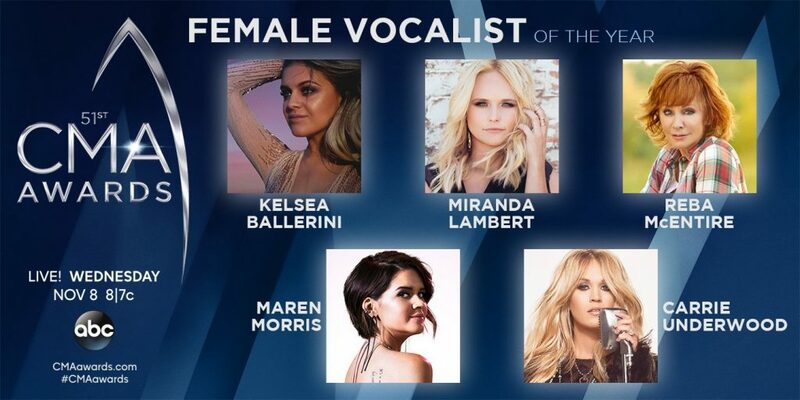 Kelsea stands an outside chance but I can’t see it happening this year. Who will win – Thinking it’s time to pass the crown and the new owner will be Maren. Who will win – Now this could be interesting. It goes to Thomas in my opinion but there’s definitely a lot of room here for any artist on this list to win. Who should win – As much as I’d love to see Keith win this, it deserves to be Eric’s in my opinion. He is undoubtedly a great vocalist and his latest album is really strong. Who should win – As much as I LOVE Eric and Dierks, Stapleton has the vocal chops. 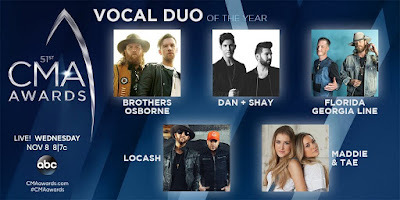 Who will & should win – Whilst Old Dominion had a strong year there’s no group here that really stand up to Little Big Town. 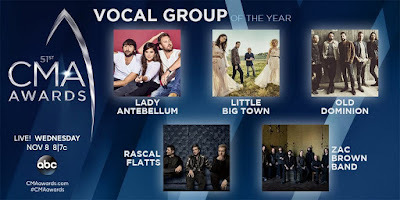 Rascal Flatts and Zac Brown Band are between albums so substantially less visible than the other three and it feels as though Lady Antebellum have fallen short of competing for this award this year. There is an outside chance of an upset with an Old Dominion win though but I’m not 100% sure they’ve had a big enough year. Who will win – Tough to call. Little Big Town should lead the way, but Lady Antebellum is “back” and Old Dominion have the momentum. 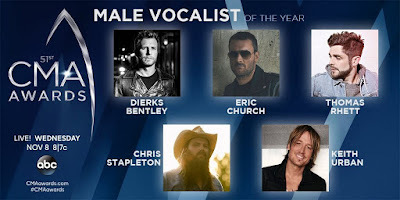 Who will & should win – I can actually comfortably see Brothers Osborne winning here. On paper Maddie & Tae and Florida Georgia Line are the strongest contenders but they’ve both had incredibly quiet years. None of the artists here has really had a breakout year but Brothers Osborne remain very popular and successful. Who will & should win - Sorry to report that I am, again, not too invested in any of these acts. Really, Dan + Shay? And what have Maddie & Tae done this year? 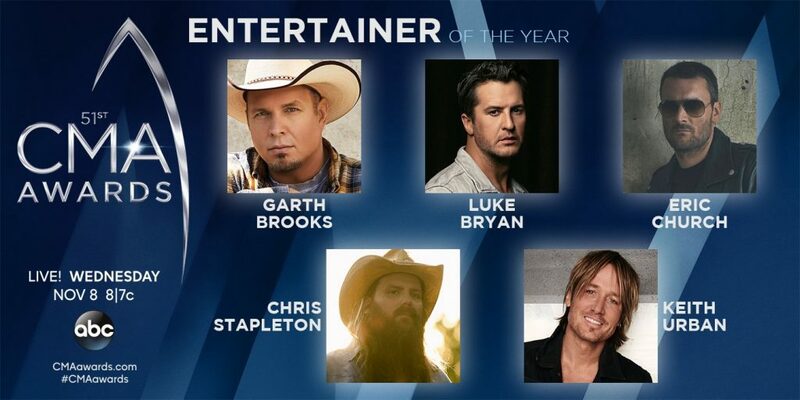 If I had to choose, my vote, and that of the CMA, will probably go to the Brothers. Who should win – As strong as Speak To A Girl is, it’d be really lovely to see Glen and Willie win this one. Who will & should win – Hard to predict after Mac’s record was broken last year but I’m going to go with this returning to him. Who will & should win - Agree with Kasey on this one. Who will & should win – I actually found none of these videos are really compelling (but then I struggle to connect with a lot of music videos) and some of these are just plain odd. Whilst Blue Ain’t Your Color is quite a good video, Better Man is the best out of the bunch here. Who will win and who should win – I am not much of a video watcher, so I had to go back and check these out again before chiming in. While “It Ain’t My Fault” is funny, I am not a fan of politics in my music. 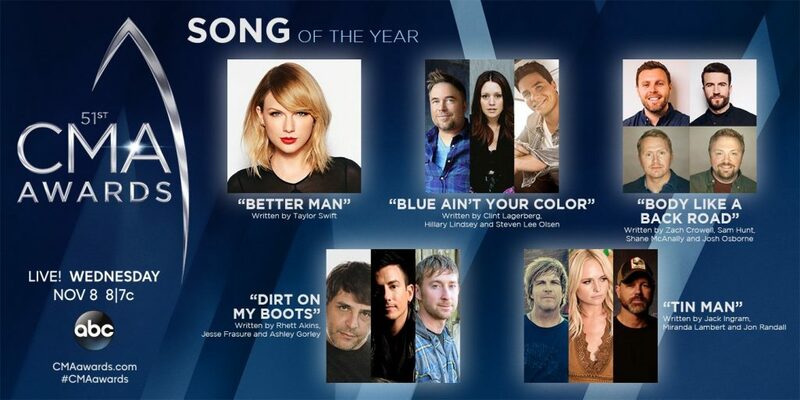 “Craving You” held my attention, Better Man” could have been better, and “Blue Ain’t Your Color” was pretty okay. There was, however, something about Miranda’s “Vice” though that had an atmosphere, an edge, and should give it the win. Who will & should win – This is going to be a close one between Lauren and Old Dominion but I’d really like to see Lauren win and I think she can pull it off. She’s undoubtedly had a great year and continues to go from strength to strength. 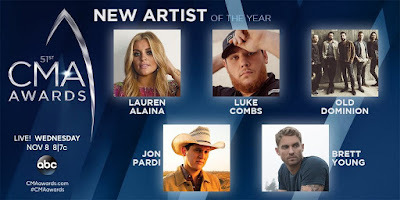 Who will & should win - What bothers me about this category is, really, are any of these guys and gal truly “new?” If I had to choose, I would say it boils down to Jon Pardi and Luke Combs. May the best man win.